What a group USk Seattle had today at the new Starbucks Roastery on Pike and Melrose! At the end of the session, we filled the sidewalk along the south side of the building with sketchers and their sketches. The number of unique viewpoints, individual style, as well as the obvious high level of accomplishment was astounding. I wish I could have looked over every sketchbook at least one more time. I arrived about 25 minutes early and couldn't find street parking no matter how many times I circled the block. No wonder! We had approximately 40 people there in our group, not to mention the "regulars" and other Seattle denizens out for a nice Sunday morning cup of coffee and/or breakfast. As I sketched the classic-looking pale green Vespa parked outside the Melrose Apartments, a woman leaned out of her top story window and called out to me: "Are you sketching the Vespa?" "Yes," I answered, "Is it yours?" "No", she replied, "but I was just on the phone with my mother, who's an artist, and I told her-Guess what? 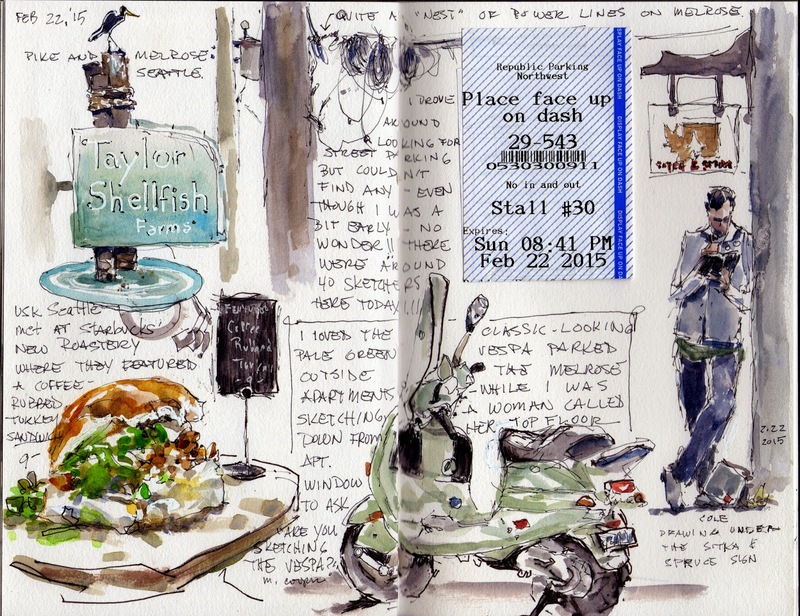 Somebody's out on the street sketching the Vespa!" For a time there, I experienced a "New York" kind of moment. I think that was one of our sketchers Vespa, Sara. She will appreciate seeing it. Great sketches. Sara, hope you like the Vespa sketch! What a perfect mode of transportation for sketching in Seattle! I wish I had taken more time to study the sketches as well. There were so many amazing ones yesterday! I like your journal approach.